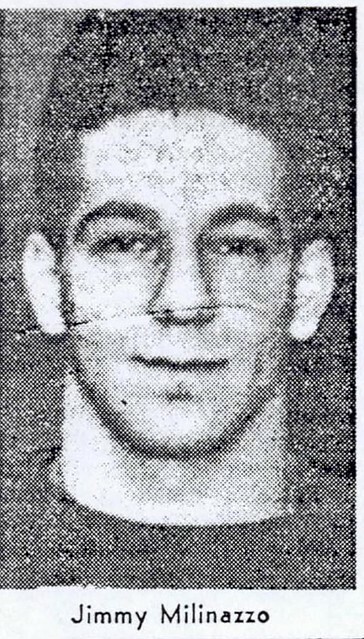 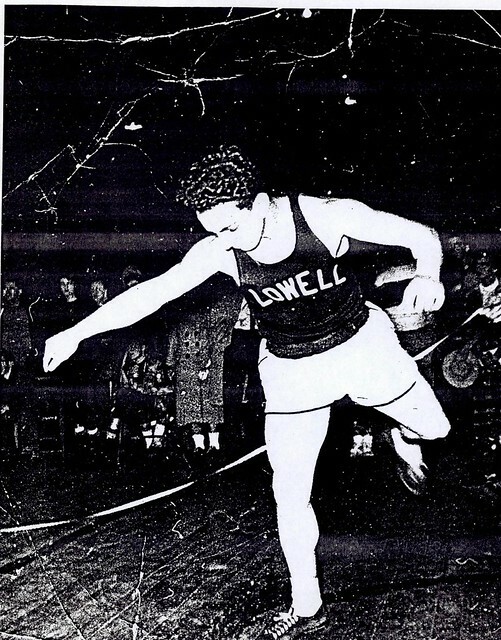 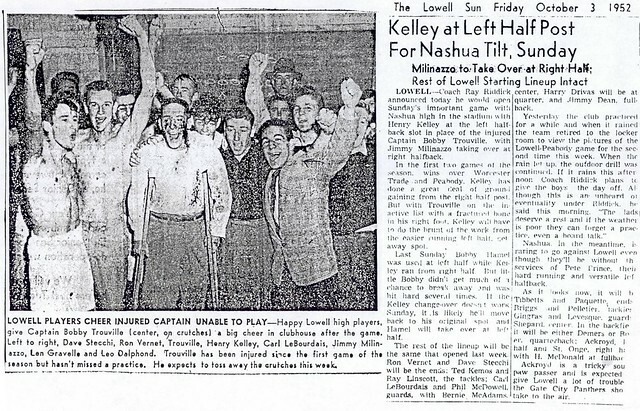 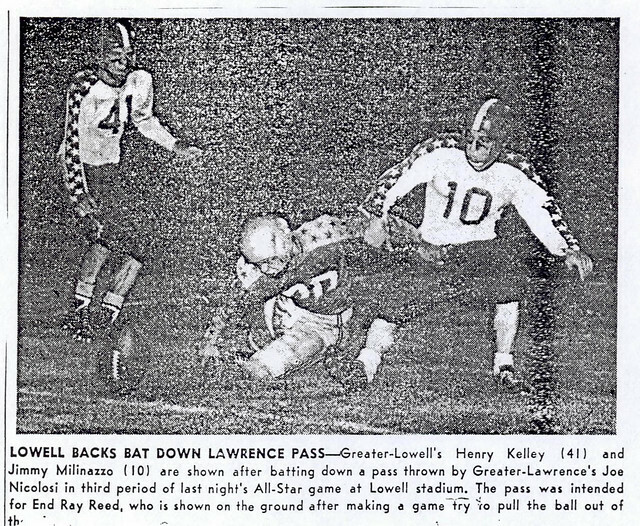 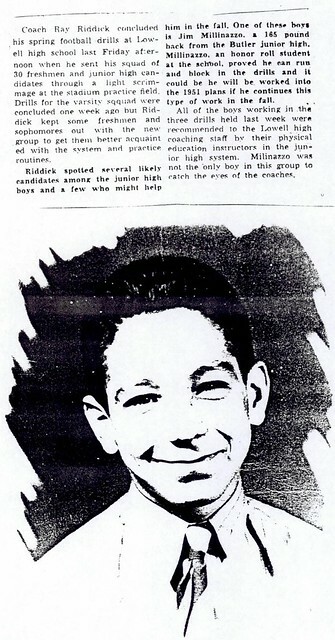 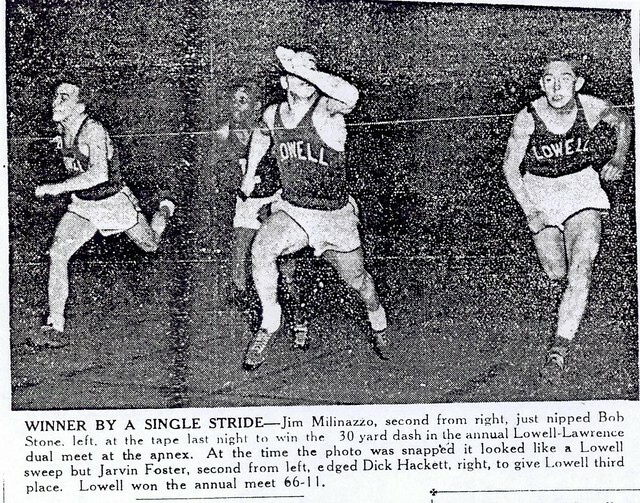 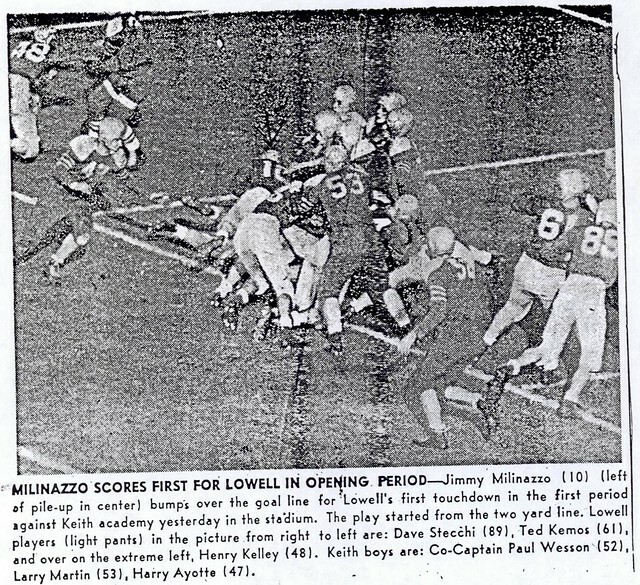 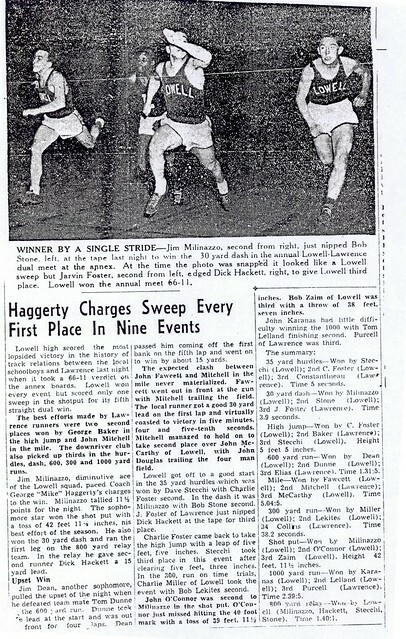 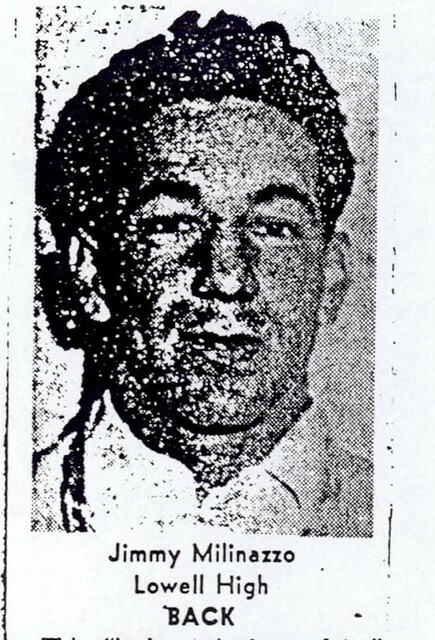 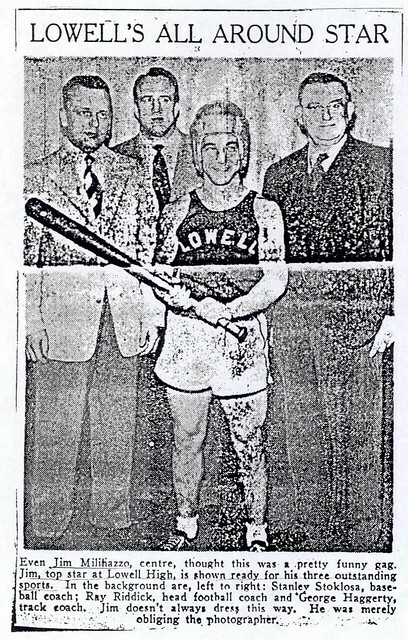 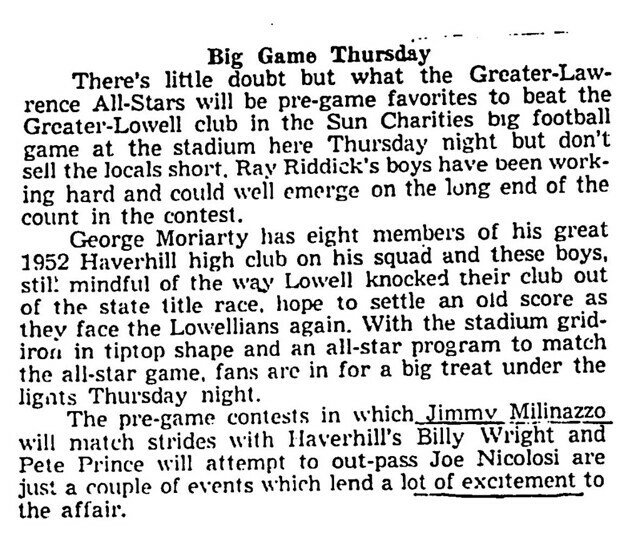 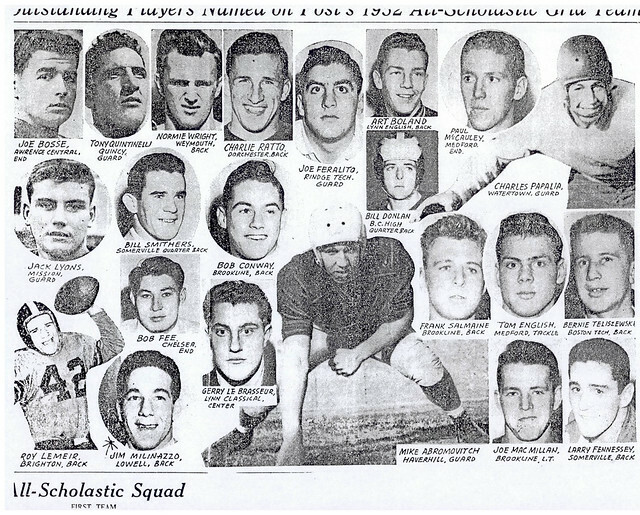 Often remembered for a Lowell Sun photograph that had him surrounded by his three Hall of Fame Coaches–Stanley Stoklosa, Ray Riddick, and George “Mike” Haggerty while he donned football helmet and track uniform while carrying a baseball bat, Vincenzo “Jimmy” Milinazzo certainly ranks as one of the great all-around athletes of the 1950’s at Lowell High School. 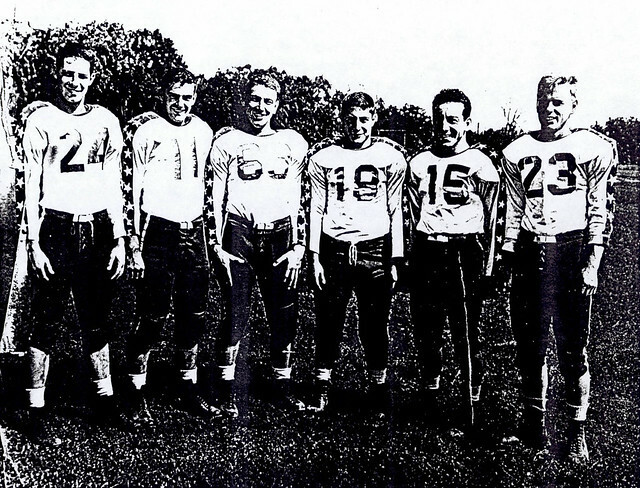 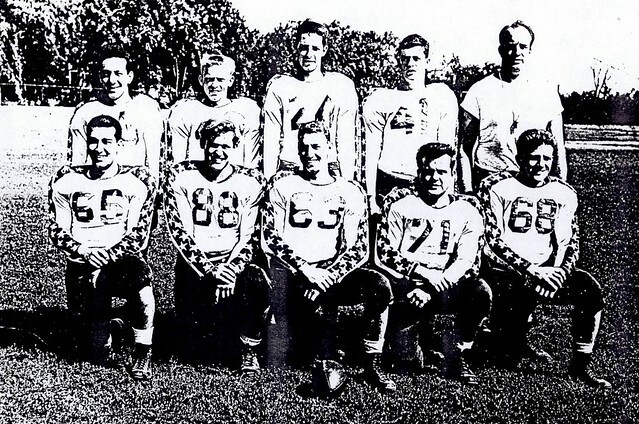 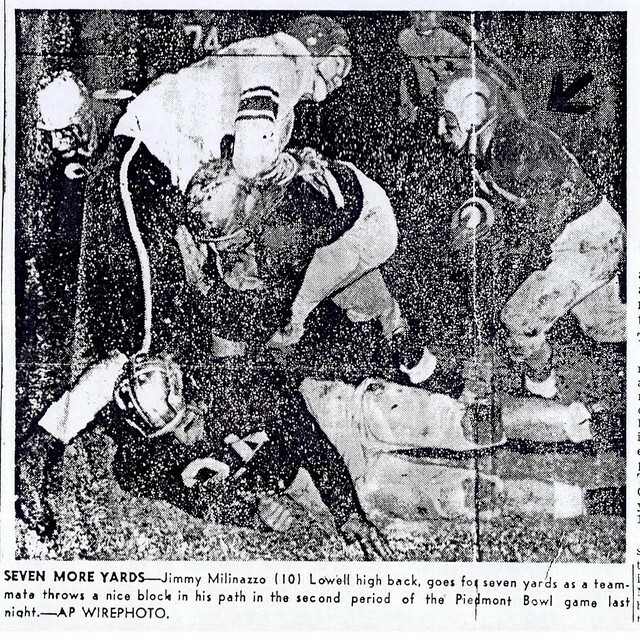 As a member of Coach Riddick’s gridiron juggernauts of the early ’50’s Jimmy became a starting halfback and safety early during his senior season. 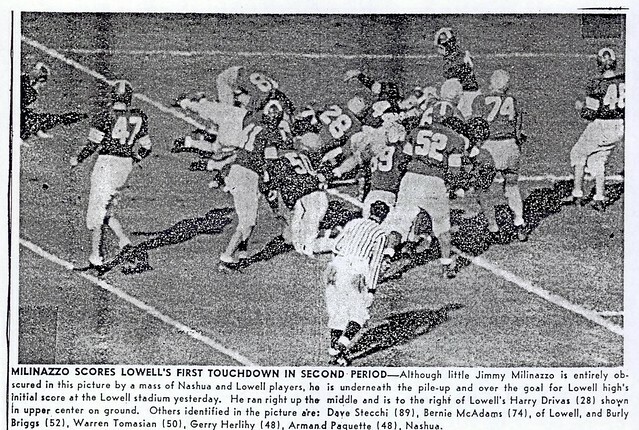 He proceeded to tally 18 touchdowns and snare 7 interceptions to help Lowell to an undefeated Class A State Championship season. 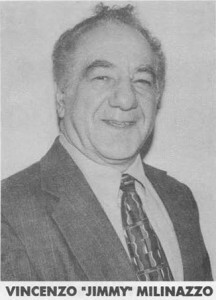 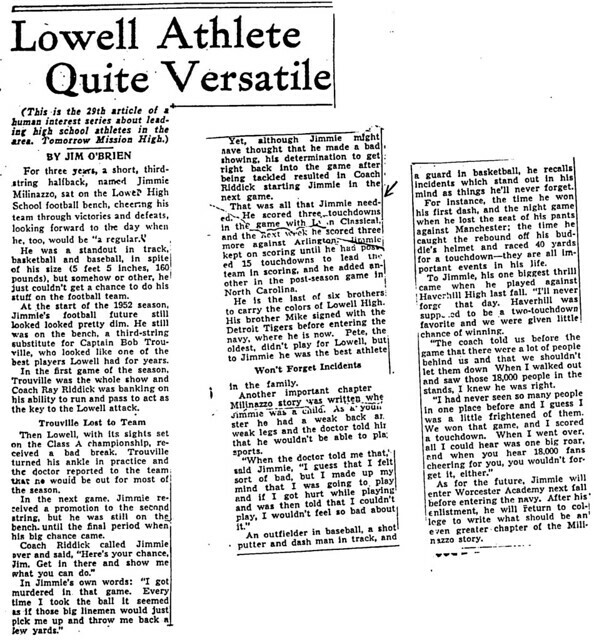 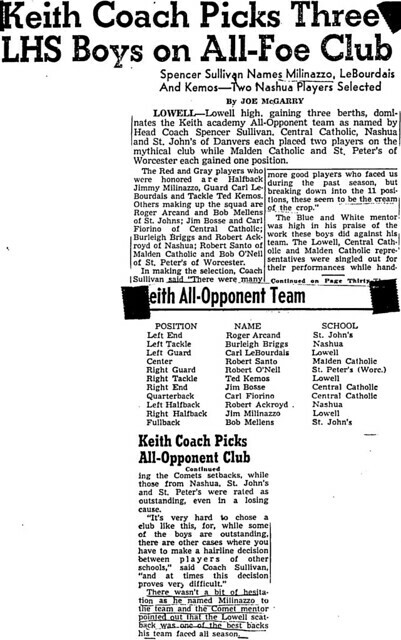 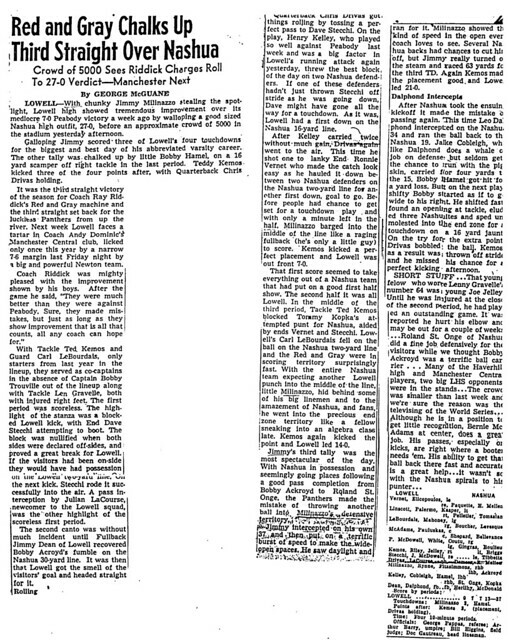 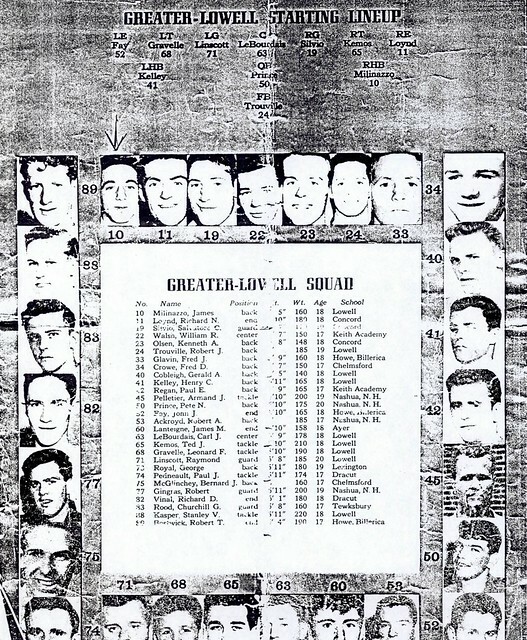 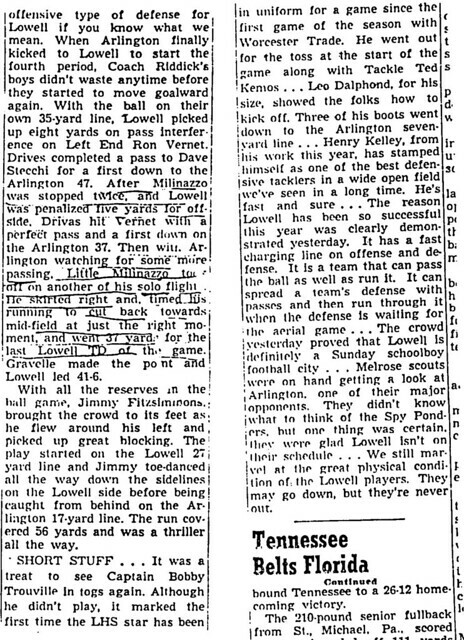 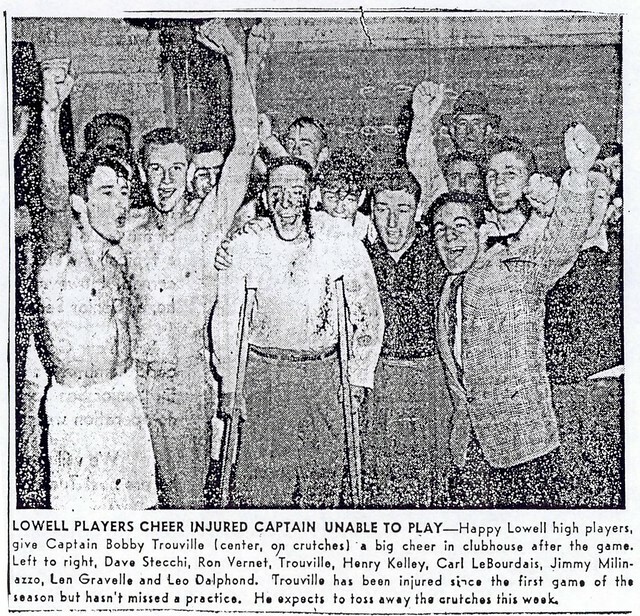 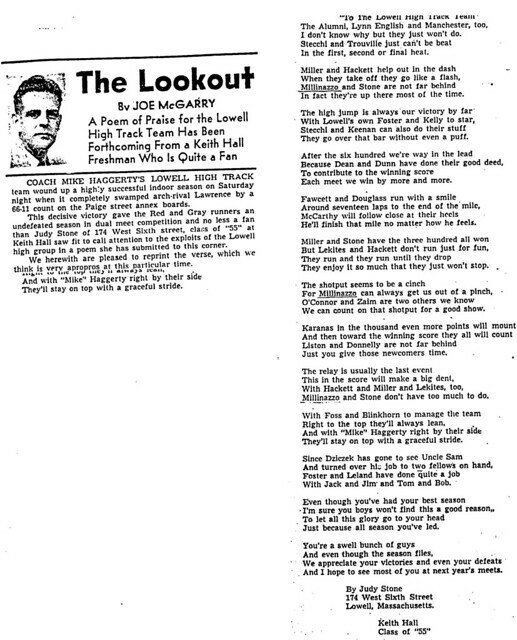 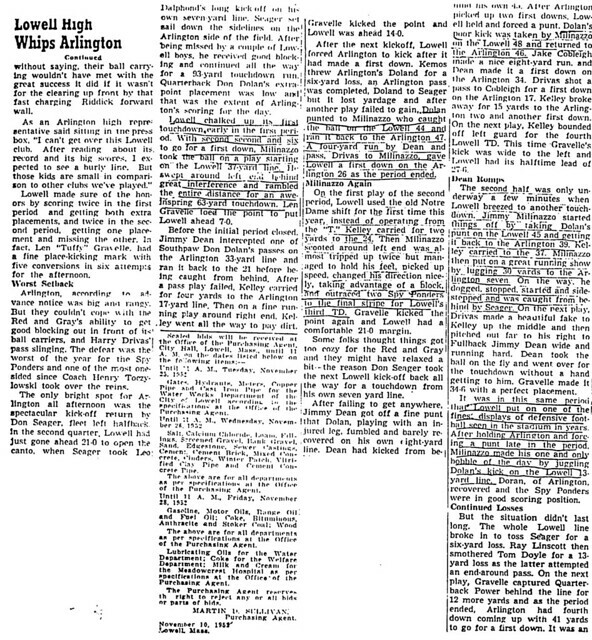 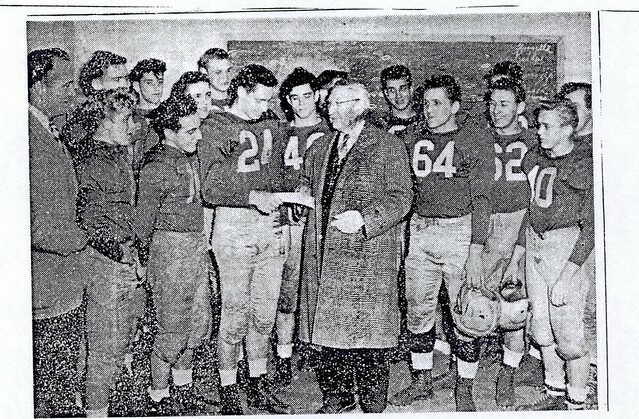 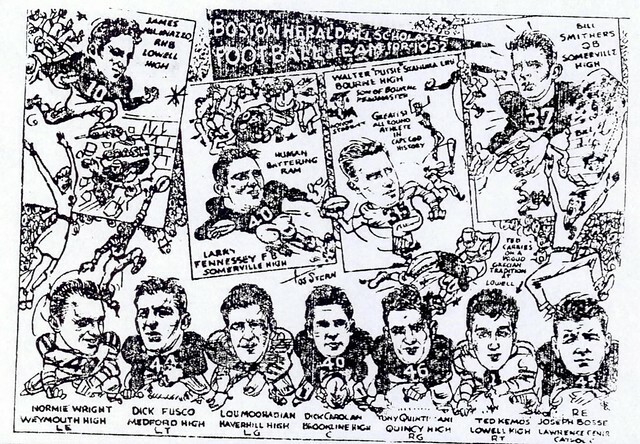 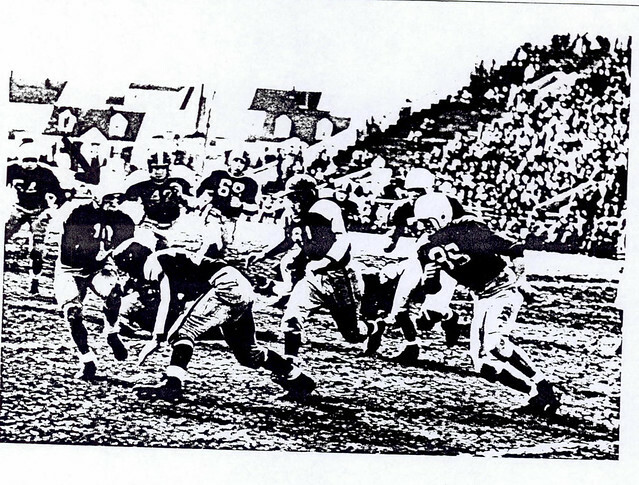 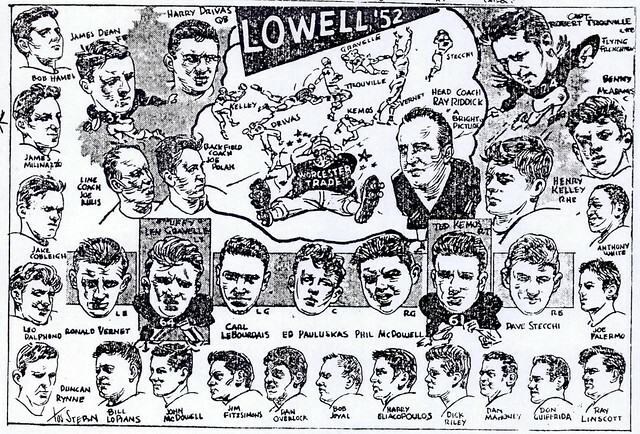 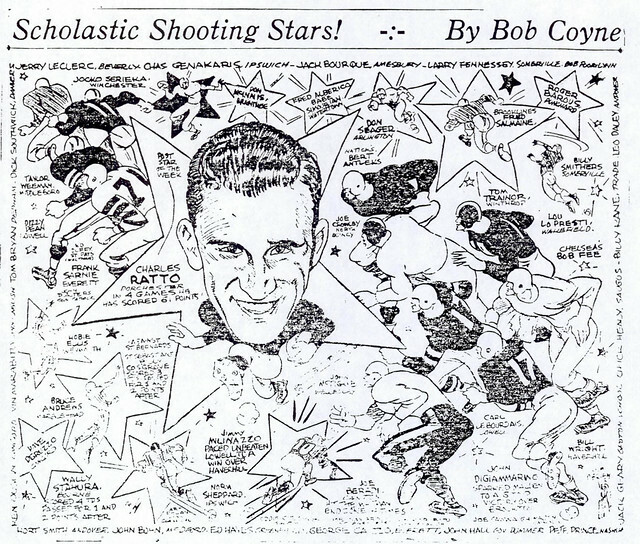 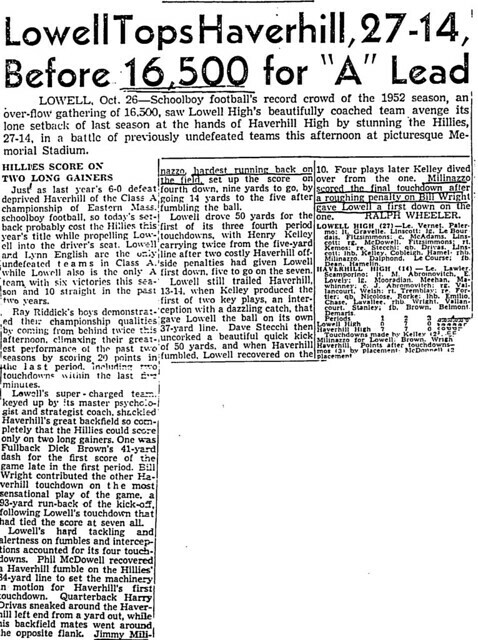 Included in his season were 3-touchdown efforts against both Lynn Classical and Arlington, several game MVP awards, and an outstanding performance in Lowell’s dramatic 27–14 showdown victory over Haverhill, a battle of unbeaten teams before some 16,500 fans at Lowell’s then named Memorial Stadium. 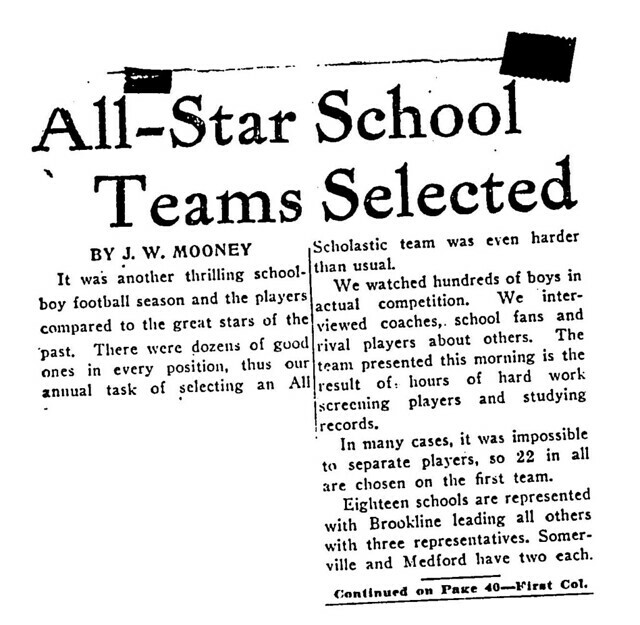 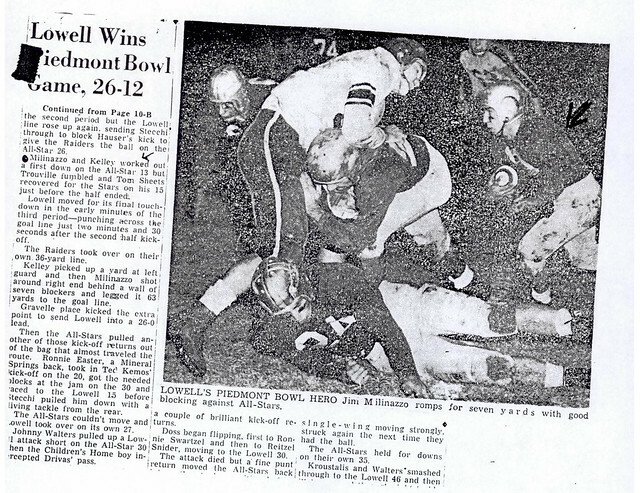 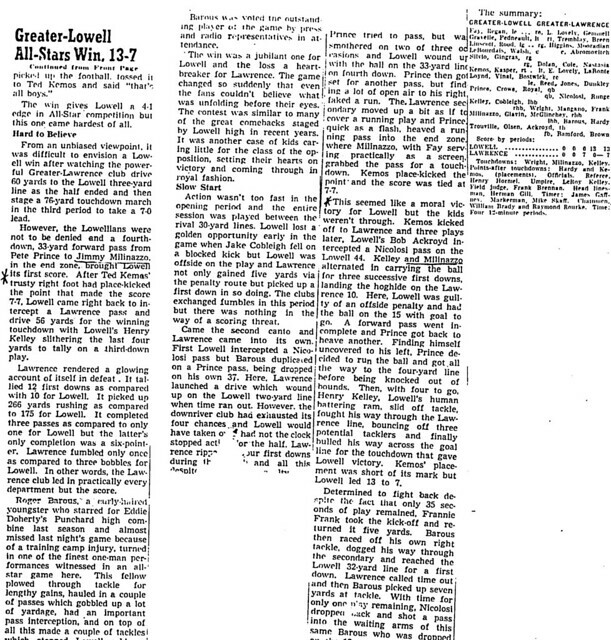 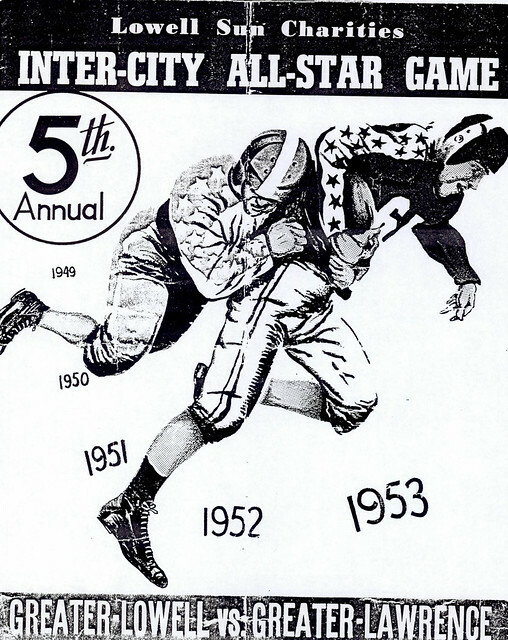 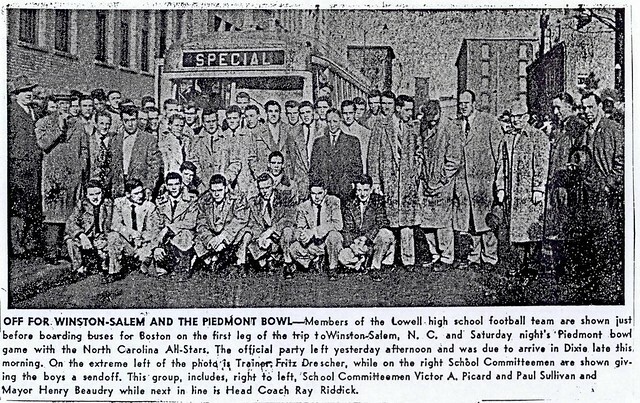 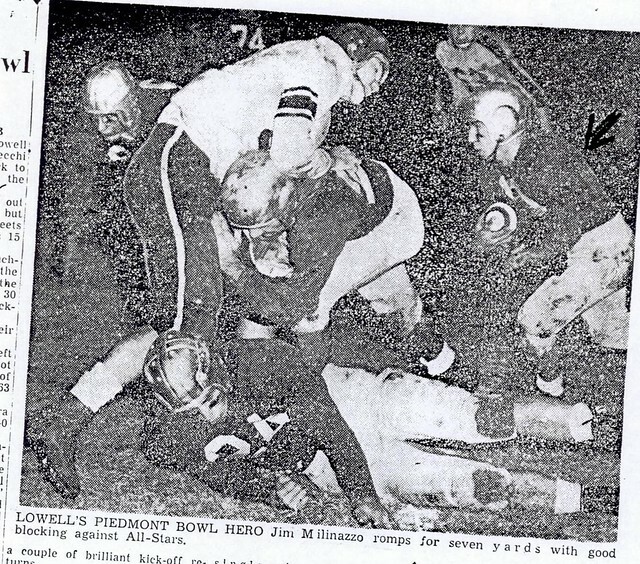 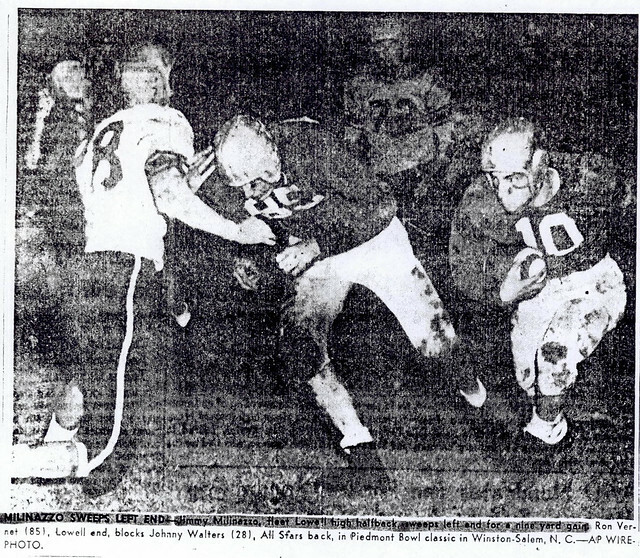 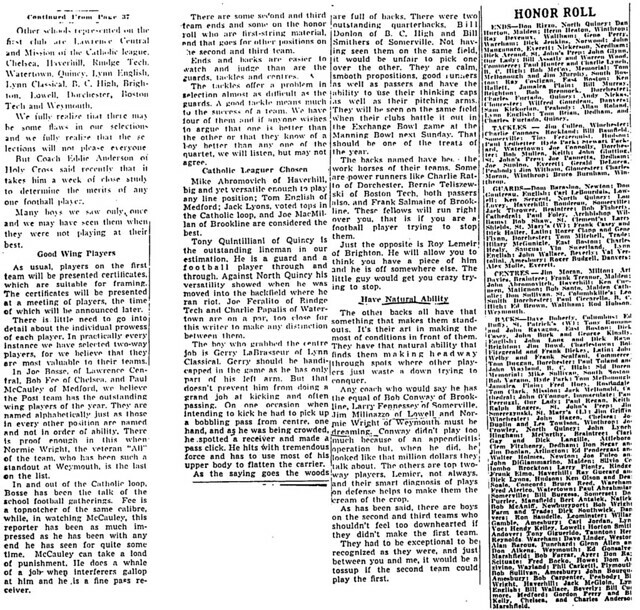 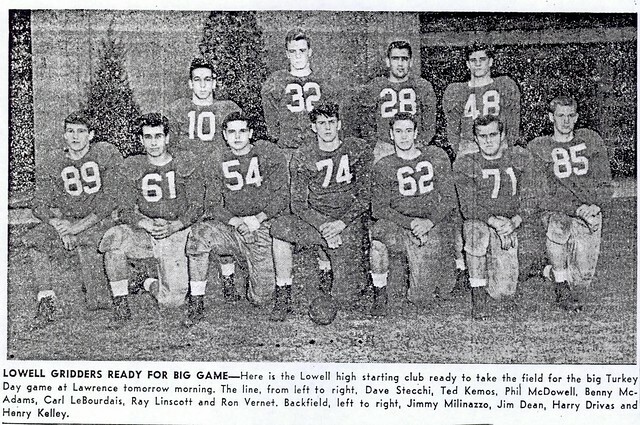 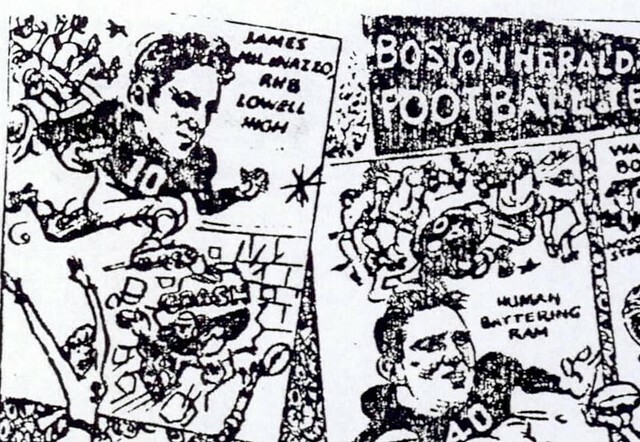 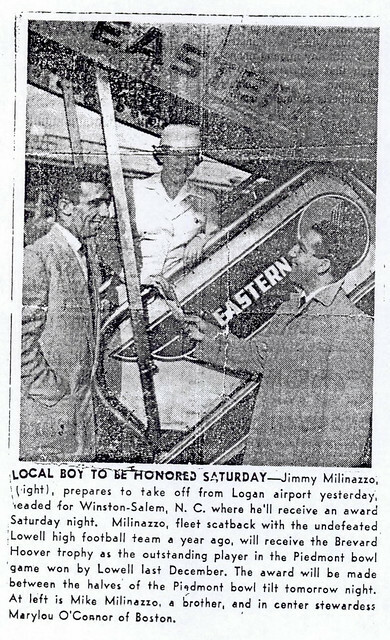 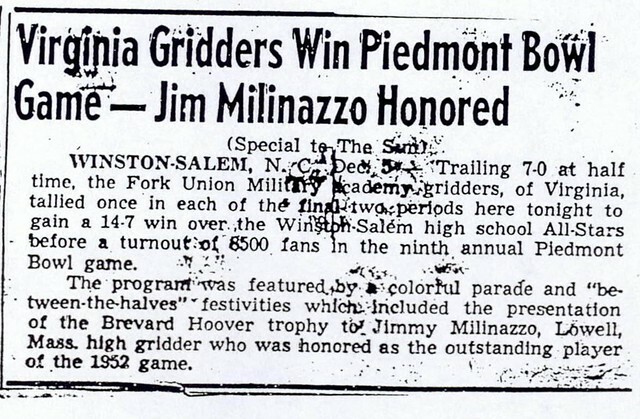 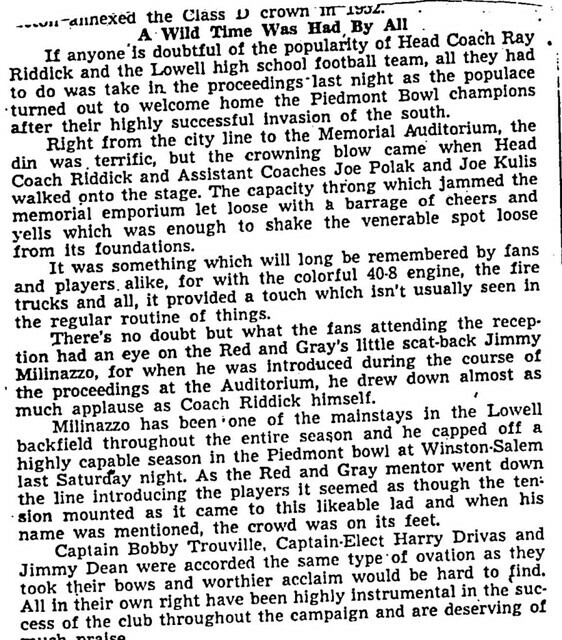 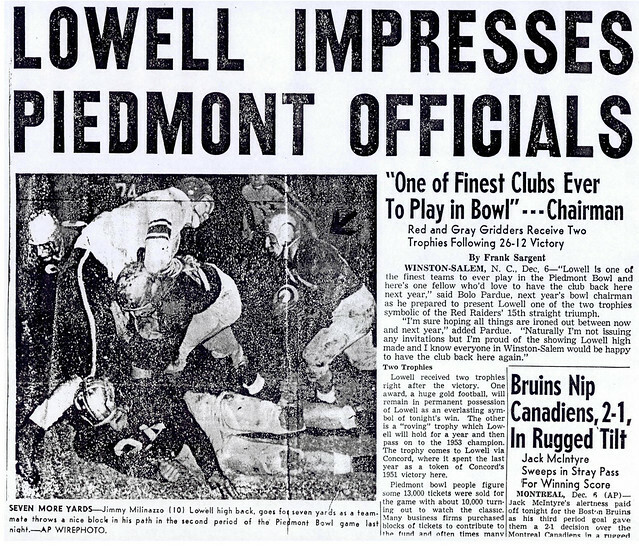 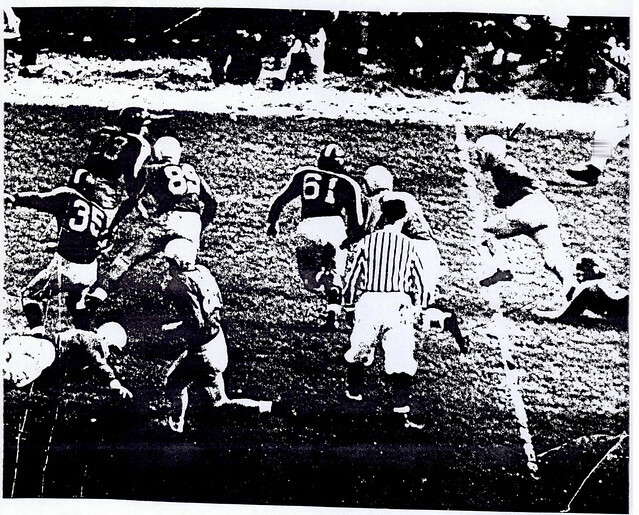 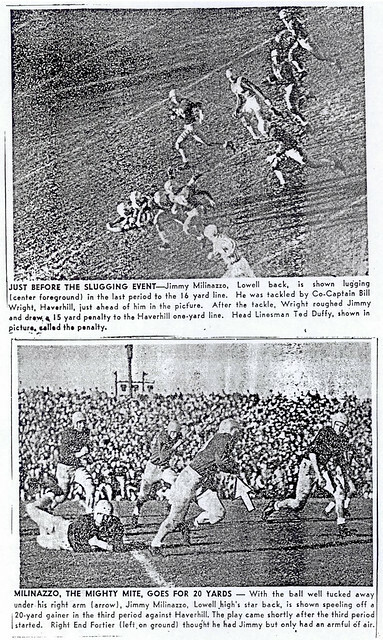 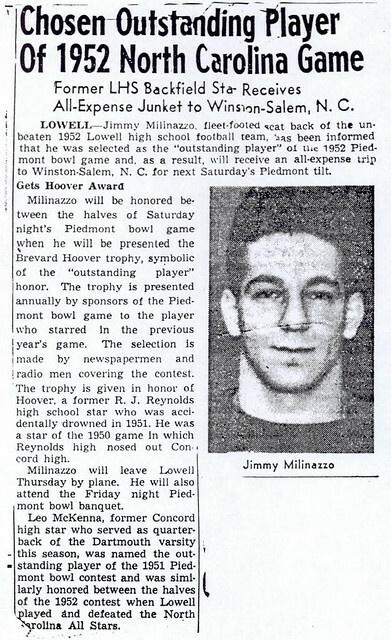 Jimmy culminated his season by scoring 2 touch­downs, rushing for more than 150 yards, and intercepting a pass to earn MVP honors as Lowell defeated the North Carolina All-Stars in the Piedmont Bowl Game in Winston-Salem, N.C. Jimmy earned All-Scholastic honors from both the Boston Post and Boston Herald following his stellar season. 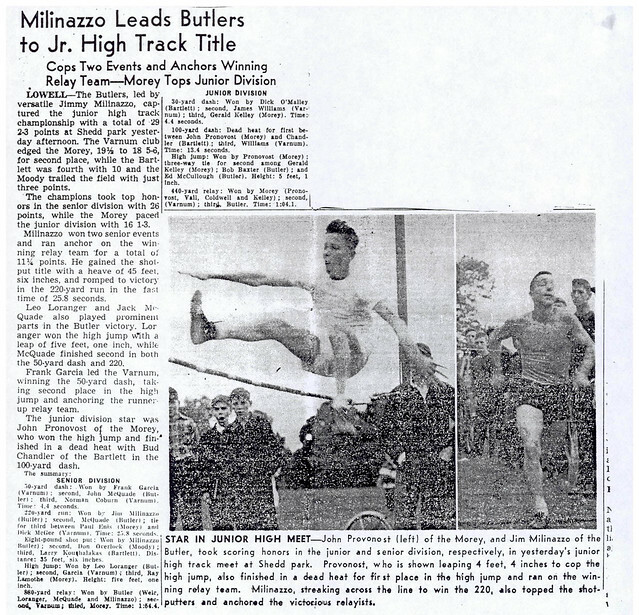 Jimmy continued his versatility while starring as a member of Coach Haggerty’s track teams. 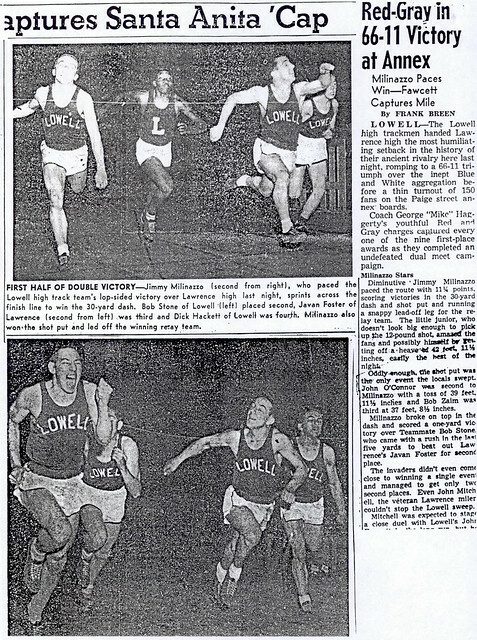 He was a consistent winner in both the dash and, despite his relatively diminutive stature, in the shot put, in addition to running a leg on the highly successful Lowell High 880-yard relay team. 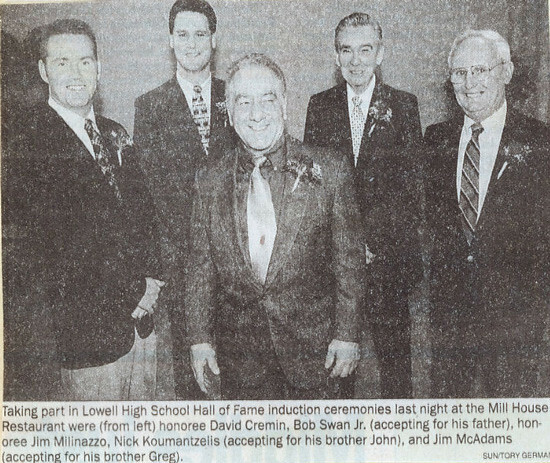 Employing his blazing speed, Jimmy patrolled the outfield for Coach Stoklosa’s baseball team. 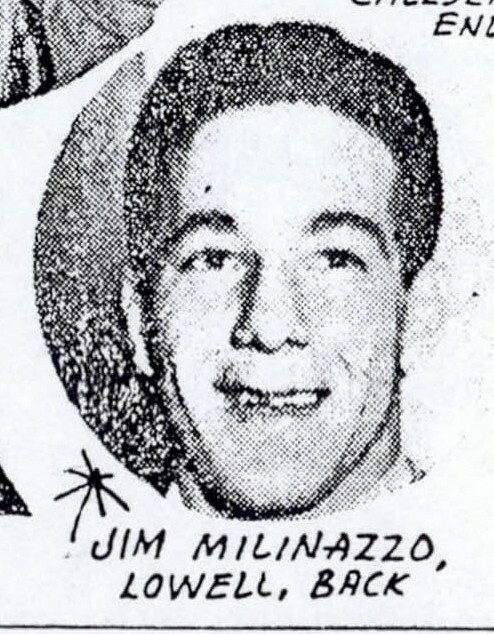 He served as the team’s leadoff hitter and led the team in stolen bases and runs scored while hitting over .300 during the 1952 season. 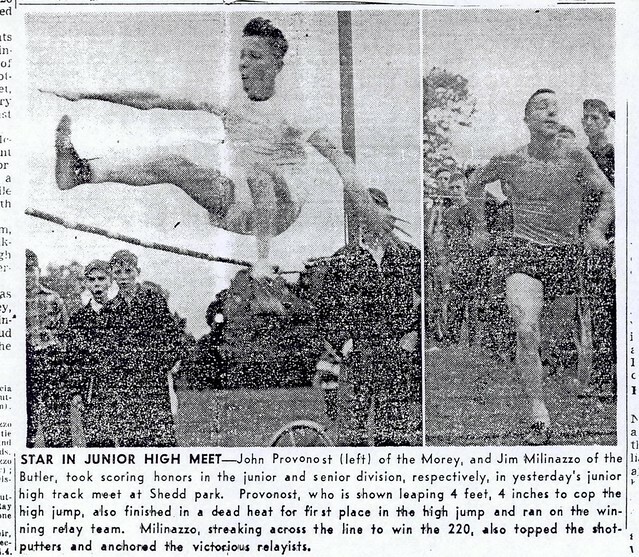 Jimmy was a rare 3-sport varsity letter winner during his senior season.